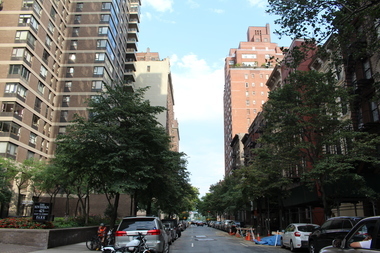 A view of East 58th Street where the new Sutton Place condominium tower could be constructed. MIDTOWN EAST — A coalition of politicians and anti-development activists is looking to pay its own way to push through proposed rezoning that would limit the construction of new skyscrapers in the neighborhood's residential areas. Councilman Ben Kallos is working with the East River 50s Alliance, a community group that coalesced around an effort to defeat plans for a 900-foot skyscraper in Sutton Place, to raise the money and dole it out to the analysts, planners, and lawyers that the activists will need in order to usher a rezoning bid through the city’s uniform land-use review process, or ULURP. A grassroots stab at a ULURP rezoning is an unusual tactic, as most rezonings come at the request of the city or an individual developer looking to build a project not allowed under an area’s current regulations. If the Department of City Planning certifies the group’s application for rezoning, the plea will then go for public review by the Community Board, the Borough President, the City Planning Commission, the City Council and, finally, the mayor. Beyond an application fee of about $30,000 for a neighborhood rezoning of more than 500,000 square feet, a ULURP does not cost the applicant anything. But in order to make sure the application is filled out correctly and in order to ensure that an entity is making a good case for the rezoning, entities generally must hire land-use lawyers and other experts to help move the rezoning through the necessary hoops, according to a Department of City Planning spokesman. Neighbors opposed to the Sutton Place tower plan met in July to begin organizing against developer Bauhouse Group which, thanks to current zoning regulations, is free to build the skyscraper as-of-right unless opponents can successfully impose height restrictions. The developer, Bauhouse Group, is currently steaming ahead with the project, having bought up properties between 426 and 432 E. 58th St. in January for $32 million. In August the firm finished assembling the air rights necessary for the project, shelling out $37.9 million for the air rights from several nearby properties, according to a report by Curbed. At the end of September, the Department of Buildings approved demolition applications for those properties, city records show. Backers of the rezoning effort are racing to impose a height limit before construction starts. They're hoping to cap the height of new buildings at either 210 or 75 feet in the Sutton Place neighborhood, which is bound by 54th Street to the south, Second Avenue to the west, 58th Street to the north and the river to the east, Kallos said. The coalition has so far been going building to building in the neighborhood, speaking with residents and tenant associations in order to gin up enough cash to push the zoning change proposal through ULURP. The group hopes to have “seven figures” in the bank in order to have enough cash ready for whatever costs might come up, and Kallos said they have already managed to put together “hundreds of thousands of dollars,” although he declined to go into specifics. “We have enough to move forward right now, but we want to have as much on hand as we might possibly need,” Kallos said.